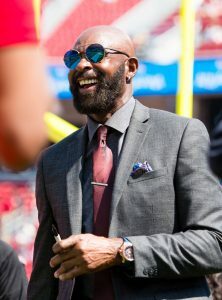 Jerry Rice is best remembered for his remarkable 16-year career with the Niners, in which he earned a dozen Pro Bowl nods and ten First-Team All-Pro selections. After that, Rice had some less remarkable – but still productive – seasons with the Raiders. His final NFL games were spent in a Seahawks uniform, but that wasn’t the original plan. On this date in 2004, Rice signed a one-year contract with the Broncos. Rice was 42 years old at the time, meaning that his plans to continue playing were ambitious, even by Jon Gruden‘s standards today. In 2004, the legendary receiver totaled just 30 catches for 429 yards and three touchdowns. Even though he still averaged an impressive 14.3 yards per reception, he was no longer the player that he once was, and Denver head coach Mike Shanahan did not guarantee his place on the roster. As the season drew near, Rice realized that he would be no higher than fourth or fifth on the Broncos’ depth chart. After serving as a role player in ’04, Rice decided in September that he would rather retire than be a role player in Denver. The receiver left the game with remarkable league-record totals of 1,549 catches for 22,895 yards and 197 touchdowns – numbers that are in no danger of being eclipsed anytime soon, unless Larry Fitzgerald changes course and decides to play into his 40s. So, Rice’s run with the Broncos never came to pass, but if you happen to have his replica orange-and-blue jersey hanging in your closet, you can probably fetch a nice price for it on eBay. Is the conversation now whether Jerry Rice or Tom Brady is the best player in NFL history? Just stirring the pot. Let’s not forget about the legacy of Jeff George. By far, the most physically gifted QB arm ever. Jerry Rice. I love Brady but you can argue Peyton Manning or Joe Montana as the better player. However, no one comes close to Jerry Rice. It’s 23,000 yards vs 16,000 yards (Terrell Owns)..